The picture Daddy carried with him to war. 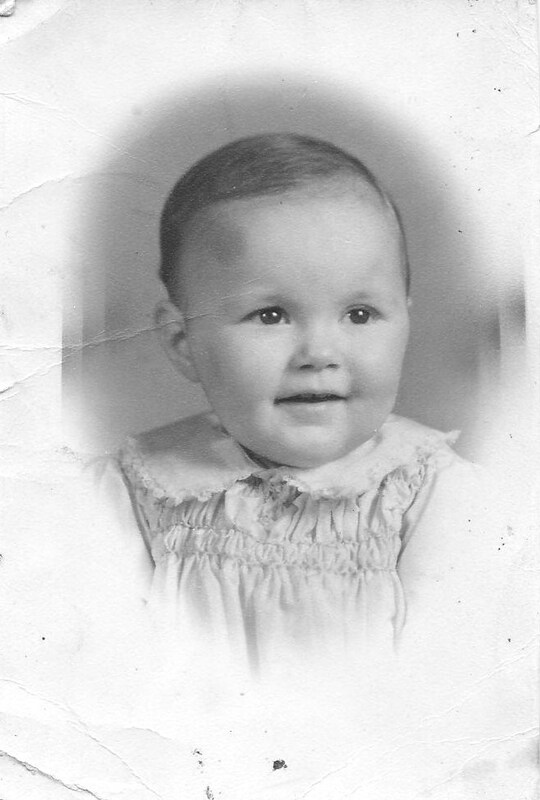 I was 6 months old when Daddy enlisted and then told Mother what he had done. I can’t imagine the shock, tears, and heartbreak when he told her. Who would take care of us? How would she face each day wondering if he would come back or die overseas? I’m sure Daddy had those same concerns but on July 6, 1943 he enlisted in the U.S. Army/Air Corp and there was nothing to do but move forward. While Mother felt he was needed at home to take care of his family, Daddy saw going overseas as the greater way to do that. I have something he wrote prior to enlisting. He wrote: “Have you ever thought of what would happen if we should lose this war we are fighting? Well I have and it isn’t a pleasant thing to think of. When I go home tired and maybe a little disgusted from a hard day’s work, my wife and baby meet me at the door with a kiss and happy smiling faces. Then I know I have everything to work and fight for. I thank God for my right to live in this great country where the rich and the poor, male and female, share alike with freedom for all.” I suppose with that, Daddy’s decision was made. Signed “To my darling wife.” Probably the first pic sent home. In our home the war was never talked about, a common behavior with WWII vets. Mother said Daddy returned home with scars all around his waist and only after much prodding did he tell her it was where he had been bitten by rats while in a foxhole. I remember Daddy waking us while sleepwalking and trying to climb the wall in the hallway. He was dreaming and thought he was in the midst of battle. Daddy returned from war with shrapnel wounds in five places. One wound was near his spine and never operable because of the potential risk of crippling him. His injuries caused swelling and temporary paralysis on one side of his body and we returned to Tennessee from Oklahoma for him get care at the Memphis VA hospital. On the back of some pictures of a house in Oklahoma, Mother wrote: “The house we bought and never got to live in.” Oklahoma was where Daddy’s four brothers lived and was intended to be our home, too. 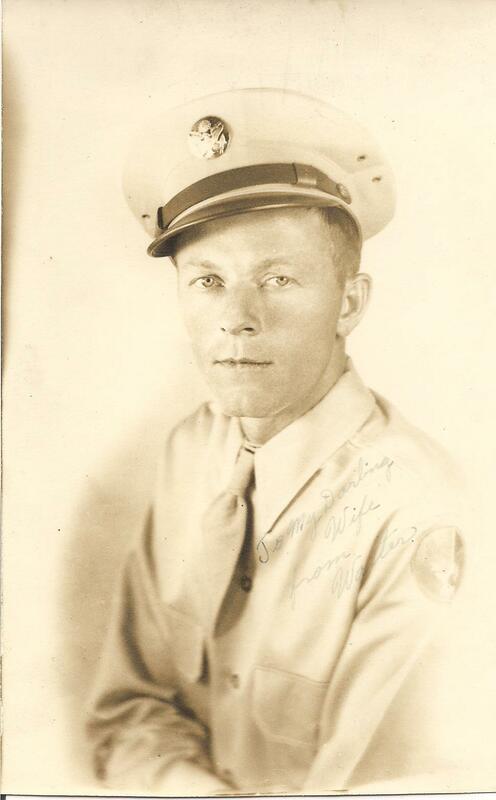 Larry said: “In spite of the hardships created by going off to war, those who returned fit back into society and made major contributions to local communities, business, church, and government. We owe them every freedom we possess. They were a generation of workers and not takers.” It was so of my dad in that he would take no compensation for his war injuries. He would say to the VA reps who visited, “Give it to a soldier who can’t work; I can.” It was another common behavior of WWII vets to not take the disability they were due. After Daddy died, Mother told me he had promised God that if He would let him return home to us he would spend the rest of his life taking care of others. I saw many ways he did that, but he never talked about any of them. We had an elderly neighbor that Daddy bathed, dressed, and walked on a daily basis when he became too feeble to care for himself. He also had wiring strung from their house to ours so the couple could push a buzzer if they needed help. He gave money to those in need when it meant a sacrifice to do so. At Daddy’s funeral, several told Mother how he for years had helped them in basic ways like taking their deposits to the bank and picking up stamps or groceries for them. I can only tell you about my dad, knowing Larry’s dad and others of WWII have similar stories. That generation lived to serve others. In closing, Larry talked about how our nation is suffering today, how we dishonor our country and scoff at God. We are concerned about a sense of entitlement with gratitude to no one and agree we have giddily positioned ourselves on the brink of disaster and are glad that our dads are not here to see it. I close with this quote by José Narosky: “In war, there are no unwounded soldiers.” The horrors of war are too great to forget. We owe a debt of gratitude to every man and woman who has fought to keep us free and their lives impacted in ways only war can do. I know each one would have a story worthy of being told, a story written in their minds and hearts forever. May God bless our military of yesterday and today. They are one and all heroes. Larry and I believe this to be a photo of a WWII vets support group; they didn’t or couldn’t talk to their families so they talked to one another. 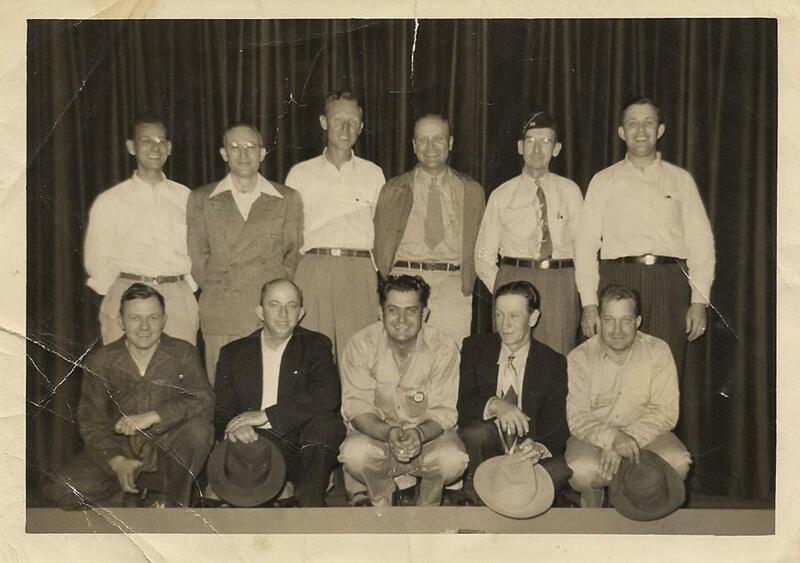 My dad, Walter Luffman, and his dad, Floyd Darby, are front row, 1st & 2nd from left.